The Fieseler Fi 156 Storch is a single-engine two- or three-seat STOL observation and liaison aircraft produced by the German manufacturer Gerhard-Fieseler-Werke GmbH. The Fieseler storch is renowned for it's remarkable short field takeoff and landing characteristics and extremly low stalling speed of 50 km/h (31 mph / 27 kt). The Fi 156 is able to take off in less than 45 m (150 ft) and land in 18 m (60 ft). 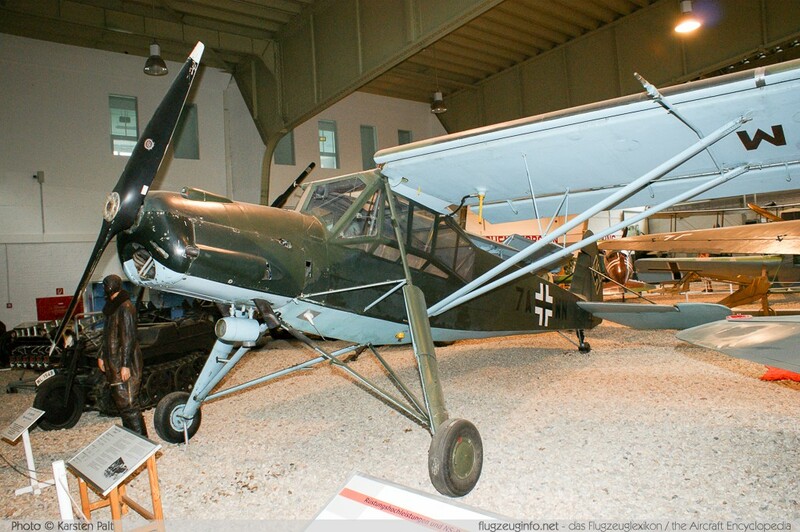 The Fi 156 was produced during WWII also in France by Morane-Saulnier and in Protectorate of Bohemia and Moravia (Czechoslovakia) by Leichtbau Budweis and later Bene?-Mráz. Industria Aeronautica Româna of Romania built approx. 80 Fi 156C-3. After the war, Morane-Saulnier continued production as the M.S.500 Criquet (more than 1000 aircraft) and Bene?-Mráz as the K-65 Cáp (approx. 137 aircraft).